You will love our tailored and abbreviated version of the classic poncho. The decorative openwork of the increases paired with chunky yarn add a graphic line. 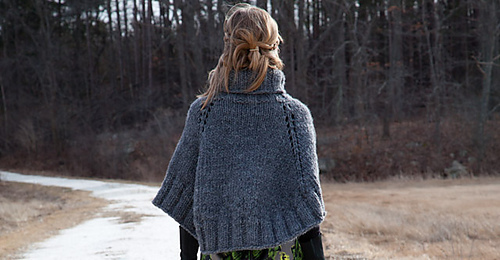 This poncho’s crisp design detail fits all your fashion needs. Made in ivory, the poncho is a soft weekend accessory; in a brilliant red, navy, grey, or black, it becomes an urban statement. Great with jeans or dressed up with a skinny little skirt. 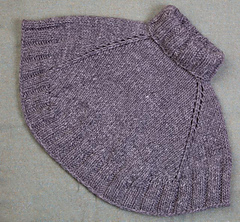 A simple project knit in the round from the top down.. Great for even an intermediate knitter, and for anyone who wants to try something fresh and new.